Rebecca Strimaitis soars as the princess who lacks gravity thanks to a curse by an evil witch. 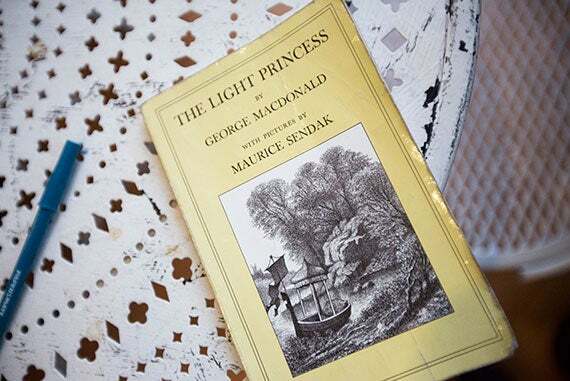 When playwright Lila Rose Kaplan was a little girl, her mother gave her the book “The Light Princess” by George MacDonald: the story of a girl who, unlike in other fairy tales, saves the prince. Inspired and in love with the story into adulthood, Kaplan connected with composer and lyricist Mike Pettry and adapted the book into a stage production. Originally published in 1864, “The Light Princess” tells the tale of a girl cursed to have no gravity and to forever float until she “finds her gravity by falling in love,” said Kaplan. The tale is “romantic and funny,” she said, including a “great heroine, who saves the prince at the end.” Author MacDonald was a mentor to Lewis Carroll. Kaplan and Pettry took their ideas and the script to the American Repertory Theater’s (A.R.T.) resident director, Allegra Libonati. “I was captivated by this idea of a protagonist who has no emotional or personal gravity, and has to find it on her own,” Libonati said, explaining she “laughed and cried” through the script. Now, over the winter holidays, others can experience “The Light Princess” too. The prince of the A.R.T.’s “The Light Princess” is deeper than the one in the book: Kaplan and Pettry made him a musician who wants to write a love song but has a difficult time with that. “We didn’t want him just to be a prop for the princess,” explained Kaplan. As the princess, Strimaitis will soon discover what it feels like to be weightless, as she suffers a curse that prevents her from having gravity. Ped Nasari (left) and Alec Wilson, both second-year graduate students from the A.R.T./MXAT Institute for Advanced Theater Training, stretch before rehearsal. 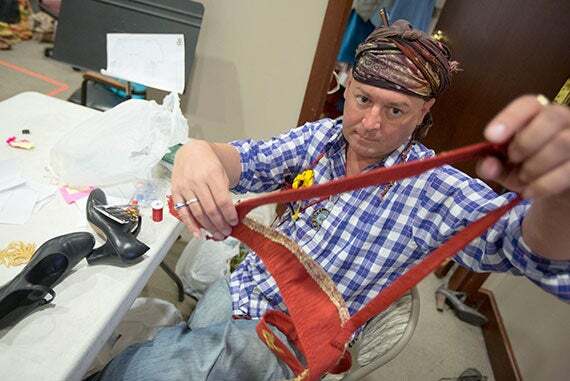 Costume designer Arthur Oliver attends to the details of the intricate costumes. This Scottish fairy tale by George MacDonald was adapted for the A.R.T. by playwright Lila Rose Kaplan, who credits the book as one of her favorite childhood tales. In addition to being visually alluring with “the floating princess in every single scene,” the production, which begins a two-week run on Dec. 21, is described as “unusually rich” and “filled with life lessons. … It’s an experience that will bring your family together, and you can bring people of all ages to,” Libonati said. Before each performance, as viewers arrive, the actors will be in the lobby in character, greeting families and accessible to children, making the production an interactive event. There will be creative activities for children as well, and they will be asked to contribute their ideas about how to solve the princess’ no-gravity problem. How can she be weighed down? Some of the solutions the young people offer will be read onstage during the performance. The actors are all second-year graduate students at the A.R.T. Institute for advanced theater training. The two choreographers, brothers Jeff and Rick ’11 Kuperman, created the aerials and magical illusions. “The Light Princess” is 70 minutes long, and will run from Dec. 21 to Jan. 5. “They are great tunes,” said Harvard choirmaster Edward E. Jones of “Jingle Bells” and “Sleigh Ride” — traditional holiday songs with a Harvard connection. Jones is seen here leading the 104th Annual Christmas Carols Service in Memorial Church.